Canon’s prime lenses are a joy to shoot with. Here is a list of the best Canon prime lenses that you can buy. This is one of the cheapest lenses that Canon produces and one that they likely sell in hundreds. 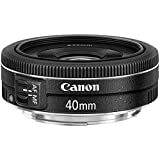 The Canon 50mm f/1.8 STM is a cheap standard prime designed for both the full-frame as well as EF-S mount lenses. 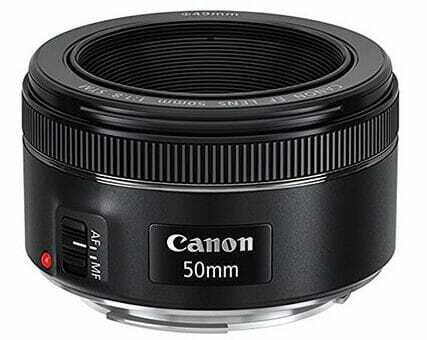 The 50mm STM comes in and has big boots to fill in the form of the 50mm f/1.8 II. It just happens to be one of the most popular lenses ever to have come out of the Canon stable. The most important difference between the two lenses being the new STM auto-focusing motor. The lens comes with a metal mount and a decent built quality. However, there is no weather, and there is no dust or dirt sealing. The bulk of the design is made of plastic, but it feels solid in the hands. The major USP of the lens is its fast wide aperture of f/1.8. At f/1.8 you easily get two stops of more light when compared to standard kit lenses. This is a big advantage when shooting in lo light. With a large maximum aperture you could capture excellent out of focus shots even in broad daylight. You will need a ND filter that will help you stop some light while shooting wide open. The lens diaphragm is made out of 7 blades rounded blades. The bokeh is very nice in quality. Another ‘improvement’ over the older lens is the new STM technology. STM technology provides smoother auto-focusing performance. This is much nicer to the jerky movement of the older USM technology. Additionally, the focusing ring on the lens is electronically coupled with the focusing motor of the camera. It is precise but at the same time this feature prevents you from turning the focusing ring manually when the camera is turned off. The lens comes with manual focusing override but you have to half press the shutter button in order for manual focusing to work. I love the 40m pancake lens (that’s what the Canon EF 40mm f/2.8 STM is fondly referred to as). It is small, uncomplicated and gets the job done without any fuss. I like that. It is one of the best Canon prime lenses. It is designed for full-frame Canon systems and thus, works on smaller APS-C cameras as well, with the crop factor slightly increasing (effectively) the focal length of the lens. Even though the 40mm is a flat pancake design, it is by no means a pushover. It consists of aspherical elements that take care of spherical aberrations. It has a fast usable f/2.8 aperture that ensures that the lens can handle most lighting conditions with élan. Canon has been incorporating its latest lenses with the new STM technology. STM stands for Stepper Motor, and it uses a more refined auto-focusing motor technology compared to the older Ultra-sonic Motor technology. This technology provides a smoother and practically noise-free auto-focusing performance. There is a caveat, however, the lens incorporates an older version of STM. It is not completely silent. Additionally, the coating on the lens suppresses ghosting and flares. Build quality of the lens is surprisingly good. It has a metal lens mount which is quite reassuring. The rest of the lens body is plastic and glass, with a few exceptions where metals are used inside. With a 7-blade circular diaphragm and a maximum aperture of f/2.8, you would get great bokeh, but the out of focus effects are not too bad either. The lens is perfect for shooting standard POV (point of view) stills and movies. 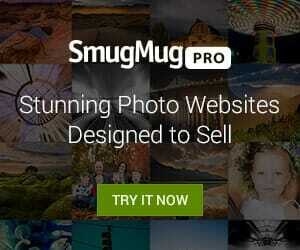 It works great as a street photography tool. There are a few problem areas as well. There is no built-in image stabilization. And that means you have to shoot at least at 1/40 or faster to avoid image blur. The AF motor sound does filter through when shooting videos. Performance wise the lens is acceptably sharp. There is some amount of vignetting around the edges, especially when you shoot at f/2.8. That tends to go away when you stop down to f/4. It has some decent macro abilities as well. It can shoot at a minimum distance of 30cm. I always leave rave reviews of this whenever someone challenges the utility of this lens. For the single reason that the Canon 85mm f/1.2L II fits the bill as the perfect portrait lens for APS-C systems. On crop systems, the lens does become slightly longer. Giving a medium telephoto range of 127mm. Why is this lens so popular? Two reasons. First, it’s bright f/1.2 aperture which makes it one of the best lenses to shoot with. Second, the 85mm aperture is ideal for portraitures if you are using an APS-C camera. The 8-blade circular diaphragm creates very beautiful soft bokeh which makes the background melt. This is something a lot of photographers, and clients look for. Build quality is excellent. The lens is rated to be both dust and moisture resistant and that means. Metal lens mount and large amounts of high-quality glass complete the lens build. The metal mount and the sold construction is pretty good. The lens comes with super spectra coating. This ensures better light transmission as well as better suppression of ghosting and flares. There are some downsides to this lens as well. Shooting wide open at f/1.2 however, can be difficult at times. Especially when you are using manual focusing. The razor thin depth of field is extremely difficult to work with. Even the slightest movement of your hands or the slightest wrong turn of the focusing ring can ruin your images. To be fair with the lens, however, the manual focusing ring is quite pronounced and turns a long way. This means you can make very small adjustments when adjusting focus. Auto-focusing is powered by the USM auto-focusing motor. Auto-focusing performance is smooth and quiet but understandably slow. This is an expensive lens. At nearly 19 hundred dollars the 85mm f/1.2L II USM is beyond the reach of a lot of photographers. Regarding performance, the 85mm f/1.2L II USM is extremely sharp. It is one of the sharpest lenses that Canon currently sells. Even at full wide open, the lens is quite sharp and even at the corners of the frame. Sharpness increases as you stop the lens down. The Canon 135mm f/2 is an EF Mount L Series Lens and one of the best Canon prime lenses around. EF mount means the lens is designed for the full-frame camera systems. The L series tag signifies that the lens is well crafted, not just performance-wise but also regarding build quality. 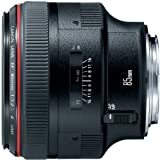 If the 85mm f/1.2L II USM above is the ideal portrait lens for APS-C systems, then that tag will be taken by the Canon EF 135mm f/2 L USM for full-frame systems. When the lens is mounted on an APS-C system, the lens assumes the effective focal length of a medium telephoto lens (216mm). Why would you need a long lens like this for shooting portraitures? The reason is with a longer lens the proportions of the nose and ears appear correct in a portrait. This is because you have to stand further away from your subject. This eliminates the chance of distortions. However, with the long nature of the lens and the fact that the lens has a fast aperture, you can isolate the subject from the background and produce really interesting shallow background effects. Speaking of distortions, the lens performs admirably when shooting at its widest aperture. Excellent center and corner sharpness. When you stop down the lens image sharpness, and contrast becomes even better. The lens lacks image stabilization though. And that means hand-held shooting at anything less than 1/135 is going to be a problem. I love shooting macro. They are incredibly absorbing and gratifying. The problem, however, with shooting macro photography is that you need the right tools. You absolutely need a tripod and also a proper macro lens to work with. I am sure you might be mumbling at this point – what about lens reversal techniques or extension tubes? Well, these are not the perfect tools to work with. If you are interested in macro photography on a full term basis you need a proper macro lens. True macro lenses will give you a 100% life-size reproduction. That means the lens will project a subject the same size as what it is in real life. That is an excellent way to shoot flowers, bugs, leaves, water droplets and anything that catches your fancy. You can pretty much let your imagination run riot with this lens. This is an L lens. It means Canon has constructed it better than the standard lenses. It has a metal lens mount and good build quality. There are sealing around the metal mount which keeps dust and dirt away. Internally, the lens has ultra-low dispersion lens elements which keep chromatic aberrations under check. The lens features a hybrid image stabilization system. It is rated at 5 stops. This image stabilization works very well, especially when you are away from your subject. When shooting from extremely close distances image stabilization counterbalances only minimal hand movement. The longish focal length ensures that you can shoot from much further back and yet be able to focus close. As close as 12″ from your subject. Speaking of focusing auto-focusing on the Canon EF 100mm f/2.8 L features the older USM technology. It is precise but it is not exactly quick. Thus, you will find the lens taking considerable time to lock focus. Image sharpness is good. Even when the lens is wide open while shooting. If you stop down to f/4 or even f/5.6 lens sharpness increases, both the center and the corner. By far the most brilliant 24mm prime that Canon currently sells. 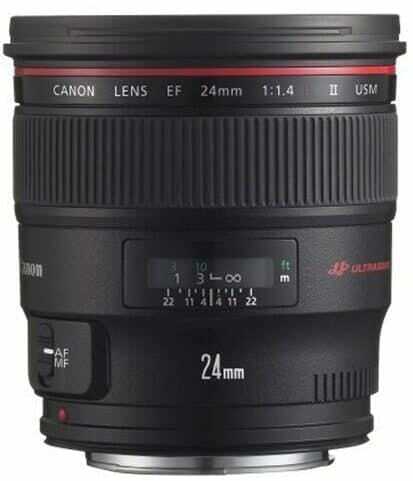 The Canon 24mm f/1.4L II USM is a fast wide lens. A fast wide lens may sound like an aberration. It does not fit the typical landscape lens requirement as such lenses tend to be wider. At the same time, the lens is wide enough to produce distorted portraits. So, shooting portraits is not exactly what you may have in mind when buying this lens. In many ways when shooting landscapes, you don’t always shoot at f/1.4. When shooting portraits, however, you do use a fast wide aperture, but the focal length is usually longer. Confused? Well, this lens is not a bad investment after all. Despite the nearly 1.5K price tag. This is an EF mount lens. That means it will work with full-frame as well as APS-C systems without any issues. The internal construction of this lens consists of two aspherical elements and two UD elements. Subwavelength lens coating on the lens suppresses flares and ghosting. This technology is much superior to the older Super Spectra Coating that traditional Canon lenses come with. If you know how to handle this lens can be a handy landscape and portrait shooter. When shooting landscape, stop down the lens and take several steps back to fit the entire picture. When shooting portraits, frame your subject towards the middle of the frame and you can take advantage of the fastest aperture. This is an extremely well-built lens with great weather sealing and a solid metal mount. The lens does incorporate plastic elements but does not feel plasticky. It, in fact, it feels very solid in the hands. Auto-focusing on the lens is the older USM technology. This technology is faster than, but not as smooth as the new STM technology. If you are going to predominantly shoot stills, you wouldn’t mind it. The lens comes with full-time manual focusing. You can grab the focusing ring and adjust focusing even in auto-focusing mode. This is a fairly sharp lens even when shot with wide open apertures. Slight distortions at the corners which go away when you stop the lens by a stop or two. Overall sharpness increases at f/4 when the lens produces great results across the frame. The Canon EF 400mm f/4 DO is a telephoto prime lens ideal for birding, sports and action photos. And if I can add, one of the best Canon prime lenses around. With this lens, you would be able to shoot much further away from relative safety when you are photographing such tough assignments. The letters DO stands for Diffractive Optics. This results in a much lighter construction without any reduction in the quality of the lens. This is a stop slower than the 400mm f/2.8L that Canon also sells. But this is the only 400mm that comes with the DO technology. The internal construction of the lens features a gapless dual-layer diffractive optics. This is the third generation DO design which suppresses chromatic aberrations. In addition to this, there is a protective fluorine coating on the front and back elements. This layer prevents smearing or dirt and grime from sticking on to the glass. A large front element coupled with an f/2.8 maximum aperture are the striking features of the lens. You also get a three-mode optical image stabilizer. The image stabilization rating is three stops. The lens is compatible with Canon’s 1.4x teleconverter. This teleconverter extends the reach of the lens all the way up to 560mm with a one-stop drop in maximum aperture. But even without the teleconverter, this is a mighty lens. The wide f/4 aperture ensures a lot of light which comes in handy when shooting at dawn or dusk. Related Post: Prime Lenses vs Zoom Lenses – Which One is Better?